Playdek and Yasumi Matsuno's Unsung Story will be a "complete and robust game" that chronicles a 77-year war across multiple timeline spanning episodes. Last September, mobile developer Playdek revealed that it was beginning work on a new game and its first original IP. According to Playdek's CEO Joel Goodman, it's a move that was "long overdue." It's not hard to see why he'd think that. "Our core has been together for many years and we've worked in the console space for a long time on some fairly large and significant projects," said Goodman. "We're more than ready, willing and excited to take all of that experience and put it into something that is wholly our own." The studio isn't starting small either. Its new game Unsung Story will be a tactics RPG made in collaboration with veteran game designer Yasumi Matsuno, whose work includes genre classic like Ogre Battle, Final Fantasy Tactics and Vagrant Story among others. Goodman isn't oblivious to Playdek's luck with this partnership. "[We never imagined] coming out of the gate with your first IP and being able to work with such a great creator." A great creator that, according to Goodman, has created "a magnificent world" for gamers to experience. Taking place in the fantasy realm of Rasfalia, the game will apparently chronicle the course of a conflict known as the 77 Years War. Players, in turn, will play through "episodes" taking place at different points in the game's "enormous" timeline. "An episode could be single year's worth of story while another could actually cover a span of ten years of history," explained Goodman. This episodic nature will also leave the game easily open to expansion content that he hopes will "deepen the game for players" interested in learning more about its story and world. That being the case, he insists that Unsung Story won't just be a vehicle for DLC. "First and foremost we're shipping a deep, complete and robust game." A game that Goodman also hopes will release "on more platforms than just mobile." Based just on the game's pedigree, we're hoping for much the same. 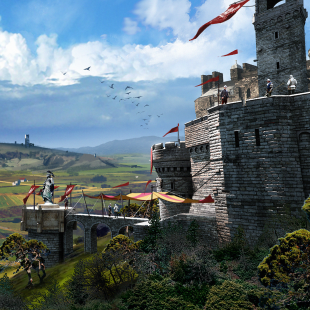 Unsung Story is an RPG that we'll be keeping our eyes on going forward.